Christine L. Marran. Ecology without Culture: Aesthetics for a Toxic World. Minneapolis, MN: University of Minnesota Press, 2017. 160 pages. Its agile survey of ecocritical responses to toxicity notwithstanding, Christine L. Marran’s Ecology without Culture: Aesthetics for a Toxic World (2017) levels most of its lasting claims in relation to the arts of the present. Her book examines a fascinating archive of Asian literature and film, with Marran bridging genres and media by way of a meticulous critical terminology she develops throughout her text.1 The close readings that emerge alongside Marran’s concepts of “obligate storytelling” and “optics of ambulation” are the most compelling aspect of the book—so much so that one wonders if Ecology without Culture sometimes buries its lede. Given Marran’s subtle analyses of those touchstones that have come to define contemporary Asian aesthetics—from Tsuchimoto Noriaki’s 1971 Minamatä Medical Films to Wu Ming-yi’s 2014 novel Man with the Compound Eyes—the book’s self-proclaimed intervention within the tired nature/culture binary feels somewhat less urgent. This is by no means intended to suggest that the discussions of aesthetics, modes of storytelling, or optic patterns do not bear upon ecological thinking. Rather, Marran’s direct treatment of toxic aesthetics represents a far more urgent intervention in the study of literature than the book’s largely summative accounts of ecocriticism and ecopolitics. In the end, Ecology without Culture marks a necessary departure from the familiar ecocritical reading praxis, forecasting where the field of “environmental humanities” might direct future inquiry: namely, toward a toxic aesthetics that characterizes the meeting point of cultural humanism and a newfound regard for the material world that supports and makes possible that humanism. “Obligate storytelling” is also a way in which the book’s aesthetic discussion and ecocritical architecture seem to be at odds with one another. Whereas this narrative technique articulates a relationship between “care and substance” and “thought and matter,” it does so by employing human language, with its many cultural tropes and associations. Ecology without Culture, in other words, is a product of precisely our scholarly moment, where if the future of ecocritical thinking is at times unclear, the need for interrogating the aesthetic traditions uprooted by ecocriticism has never seemed more important. At its most salient, the study allows us to see a vast network of texts that reconceive and redefine what Marran identifies as “the poisons of industrial modernity” and “the agency of toxins that ground these literary and filmic stories” (24–5). 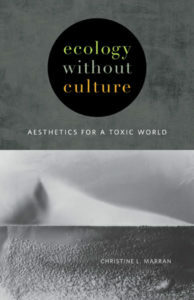 In summoning an “aesthetics for a toxic world” by way of its subtitle, the book confronts how toxicity reveals the convoluted relations of nature and culture. Toxicity, that is, cannot be a strictly material concept because it already begs a cultural and philosophical question: “Toxic for whom or what?” If we commit to “obligate storytelling,” and take seriously the idea of imagining a world “without us,” then we must also imagine that what is “toxic” for one species may not be for another, or, more troublingly, that what is “toxic” is contingent upon scale, dose, or scope, relative even within species. The very category of toxicity points out a fault line in those strains of ecocriticism that rest upon the assumption that the nature/culture binary is stable, and that our work should move beyond the “merely” cultural. For instance, Marran clearly appreciates the limits of a strictly materialist approach when outlining her concept of the “biotrope,” a term that addresses how biological substances are necessarily shaped by both material and semiotic forces (6). Much like “obligate storytelling,” the “biotrope” richly cuts across the nature/culture binary by conceding the co-constitutiveness of cultural associations and material formations, and as such, seems to intuitively challenge the idea that there can be “ecology without culture.” While the process of imagining an “ecology without culture” consequently results from cultural humanism, testing those metaphors, tropes, and patterns that inform humanism urgently updates Morton’s project from over a decade ago. That Marran sets out to revise Morton’s framework by troubling ecocriticism’s relationship to the aesthetic rendering of toxicity shows the full potential and importance of this book. A microcosm of the study writ large, Marran’s second chapter, “Slow Violence in Film,” reconceptualizes Rob Nixon’s Slow Violence and the Environmentalism of the Poor (2013) in light of film, a medium that powerfully documented the aftermath of toxic events like Hiroshima and Fukushima.4 One of her central case studies is Tsuchimoto’s Nuclear Scrapbook (1982), a film that “presents shot after shot of thirty-seven years’ worth of newspaper articles about radiation-related events around the world” (82). Attentive to the way in which these newspaper pages, referencing concrete historical moments and events, simulate a passage of time, Marran shows how film and media can help viewers actually experience and grasp the “slow violence” of radioactive toxicity. 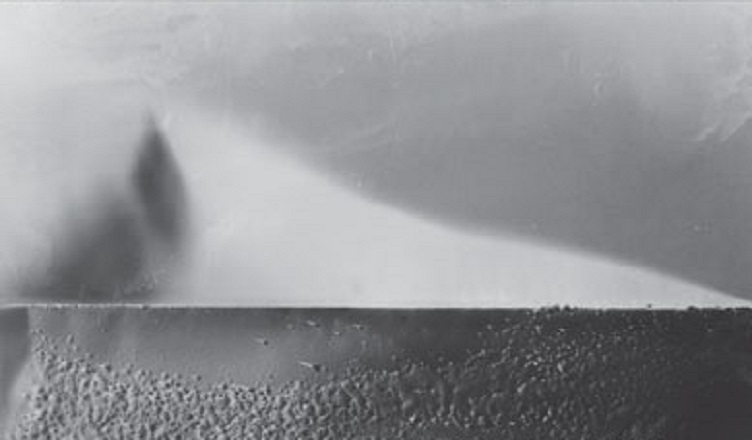 Furthermore, in its nearly avant-garde style, Nuclear Scrapbook challenges viewers to consider the affordances and limitations of film in relaying such static images. (Why not just publish a book with these article photocopies, for example?) As Marran rightly puts it, “the two-dimensionality of the newspaper interrupts the indexicality of the filmic image” (83). Such a comment returns us to aesthetics, and implies high-level formal and medium-specific questions that become something of a motif in Ecology without Culture. What do environmental literatures and criticism offer in terms of the aesthetic traditions out of which they emerge? How can we view ecocriticism as a complement, rather than a challenge, to the conventions, tropes, and artistic principles that have a hand in producing these texts? At the last, Ecology without Culture makes an implicit albeit clear argument for why ecocriticism is articulated most clearly when placed in the context of a close reading praxis that takes seriously the idea of aesthetics. Marran’s archive consists primarily of Japanese writers and artists, following the trajectory set by Japan studies, but she pointedly places her key texts in conversation with work from other Asian nations and traditions. Wu Ming-yi, for instance, is a Taiwanese author, artist, and activist. As a matter of fact I read both Ecology without Nature and Ecology without Culture as commensurately invested in a discussion of aesthetic principles and histories. In my reading, Morton and Marran agree far more than they disagree—both books attempting to understand art through the lens of ecology—even while their archives and analyses move in different directions. See Rob Nixon, Slow Violence and the Environmentalism of the Poor (Cambridge, MA: Harvard University Press, 2013). 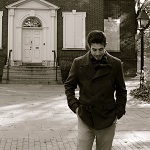 Clint Wilson III is a PhD student at Rice University in Houston, TX. Drawing on the intersection of critical media studies and biopolitics, his project explores how conceptions of "toxicity" influenced the trajectory of twentieth-century art and literature, and vice versa. His work has appeared or is forthcoming in Eighteenth Century: Theory and Interpretation, Resilience, and Environmental Philosophy.